First impressions are everything. When you’re traveling, they welcome you to a new location. They set your expectations for your time there. Plus they get you excited for the days ahead. Upon first glance, Zighy Bay has a lot to live up to. The two-hour drive from Dubai felt like it took forever. It was slow, monotonous, and barren. Your excitement had drastically dimmed by the time you crossed the border into Musandam. But, all of a sudden, things changed. There was a break in the craggy Hajar Mountains. Your driver paused the four-wheel-drive vehicle at the top of a hill when the Gulf of Oman appeared below you. A crescent beach, thousands of date-palm trees, and a stone village sat on the edge of the turquoise water. A picture-perfect resort did, too. You finally made it to Zighy Bay. Zighy Bay is very remote. The small fishing village sits on the east coast of the Musandam Peninsula. It’s a piece of land that juts into the Strait of Hormuz in between the Persian Gulf and the Gulf of Oman. It looks like it was carved by glaciers. Its rugged coastline was shaped by movement in the Earth’s crust as the Arabian Plate pushed under the Eurasian Plate. The only land the peninsula touches is the United Arab Emirates. But Musandam is actually part of Oman to the south. A long drive and multiple immigration points left it isolated for centuries. Only recently, with the introduction of a fast ferry from Muscat, have people started exploring this secluded area. There’s only one resort on Zighy Bay. 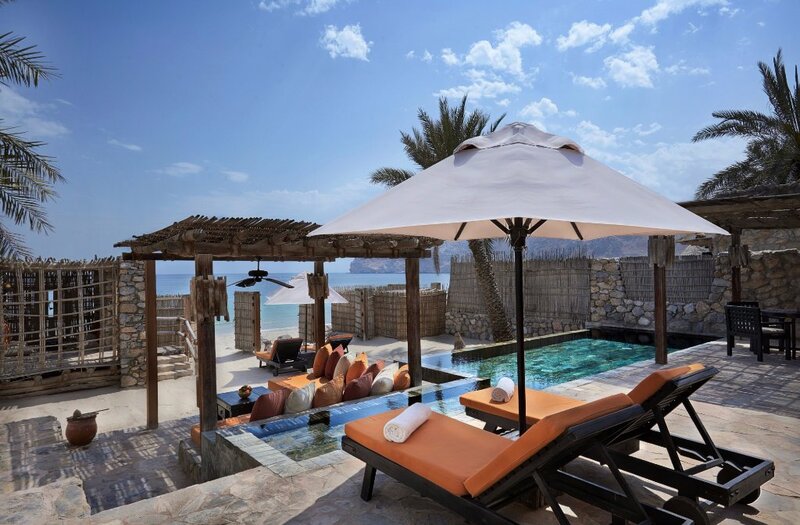 Six Senses built a resort that’s laid out like a traditional Omani village. Its low buildings are made of natural stone. They have jareed (date-palm stick) roofs and large terraces. Sandy paths, lined with fig and pomegranate trees, connect the villas. Each one has a flagstone floor, dark-wood furniture, and pops of burnt orange inside. Their outdoor living space is even larger. There’s a shady majlis (a seating area) and a plunge pool. An open-air shower, sun loungers, and umbrellas are set up, as well. While the mile-long beach is just beyond a low gate. Usually, you just want to be left alone to settle into a new resort. But your GEM (Guest Experience Maker) is helpful without being pushy. He shows you all of the amenities hidden in your villa. There’s a pre-loaded iPod, an espresso machine, and a wine fridge stocked according to your taste. Two bikes sit outside. They have padded peddles, since no one expects you to wear shoes on the property. You can ride them to the pools, the spa, the dive shop, or the outdoor cinema. The GEM describes the restaurants and specifically suggests the oven-baked lamb from the sand pit at the Shua Shack on the beach. You can’t miss Sense on the Edge, a clifftop restaurant overlooking the hotel, flickering torches, and the starry sky at night either. Then there’s all the activities. Hiking the nearby goat paths, canyoning in a rocky wadi, and paragliding from the surrounding cliffs are all possibilities. You can also cruise the fjords on the Dhahab, a 90-foot restored dhow. 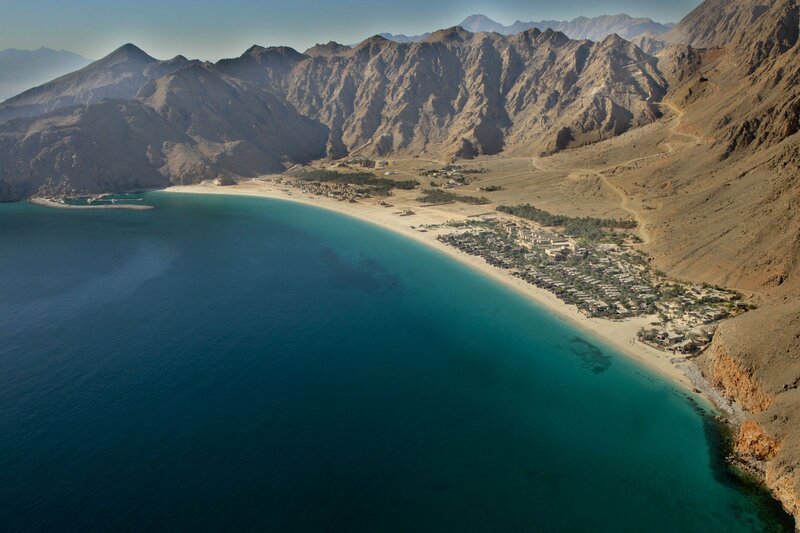 Six Senses Zighy Bay certainly offers an impressive first impression.